Q: The source code and all information about your project is published. Can I do what I want with all the info/ code? You are allowed to copy, distribute and transmit the work, as well as to adapt the work. or 3S 800mAh 1 ? ? Q: Can you build one for me? A: I am not building complete tricopters for you, but you can sometimes get some components (TriGUIDE mini v2, I²C->PWM converters) from me. Just ask if I have some at the moment. 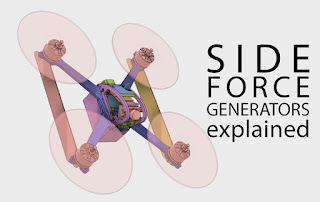 Q: What is the difference between the micro tricopter (Shrediquette DLXm) and the standard size tricopter (Shrediquette DLX)? A: Electronics are identical, but you have to use different servos/ motors/ ESCs/ props/ batteries. Q: What is the difference betwenn the quadrocopter, hexacopter and tricopter version? A: Again, there is almost no difference. All my copters use the same electronics. Only the software that is running inside the TriGUIDE is different. All versions of the software are included in the source code zip archive. Q: What electronic components should I choose? A: You should choose exactly the same components as I am using if you want to make sure that everything will work as expected. Different receivers than the ACT DSL-4ST Typ:MK 35/40MHz may cause glitches, as I had no opportunity to test any other receivers. If you want to use other gyroscopes/ ACCs, you should really know how to program and how to change the electronics. I will not be able to give any support for these kind of changes. If you choose the same components as I, you have the advantage that you can use my configuration files for your own tricopter. This can save you some work in finding the optimal parameters. Q: What type of transmitter do I need? A: You will need a 5-channel transmitter. The fifth channel has to be a 3-stages switch. It is used to start the motors and to select flight mode (hover/ acro). Q: What kind of receiver do I need? A: You should use the ACT DSL-4ST Typ:MK 35/40MHz receiver. If you don't want to use this receiver: You'll need a 6-channel receiver that matches your transmitter. Additionally it has to deliver a single-pulse-train signal. There are some receivers available. Here is a list of receivers that can be converted to single-pulse-train (in german). If you don't want to modify your transmitter, or if you are using PCM or a 2.4GHz system, you can buy a converter here (30 Euros). If you want to avoid problems, I recommend to use the ACT DSL-4top (35 MHz) Typ: MK. The tricopter was developed with this receiver. Q: Which battery will work? A: Any 3S (11.1V) Lipo with around 2200mAh will do the job for the DLX, a 800mAh 3S battery will work for the DLXm. Q: Which propellers should I use? A: You should use the lightest propellers available. Otherwise, the control loops won't work as good, because it needs more time to accelerate a heavy propeller. Maxxprodd 8x4.5" or 10x4.5" work pretty good. Q: How long does it fly? 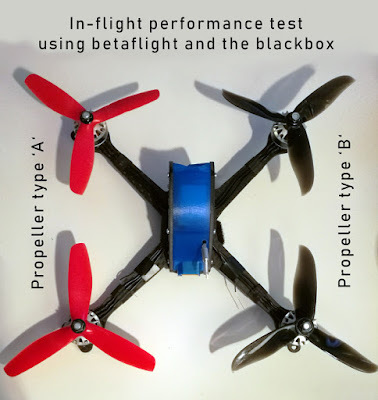 A: That depends on which motors/ propellers you are using and of the weight of the tricopter. My DLX setup (Scorpion s2212/26, prop 10x4.5, lipo 2200mAh, weight 630g) flies for about 16 minutes. The DLXm flies for 11 minutes with a 800mAh battery. Q: Does it fly stable? A: That question is hard to answer and it depends of the definition of the word "stable". It is not flying stable enough to let it fly inside my room (3.5x3.5m) without touching the sticks for longer than 5 seconds. But ouside, if there is no wind, I was already hovering for 1 minute without touching the sticks. The tricopter will stay more or less in place. Q: Does it have an auto-pilot? A: No, not yet. Three additional components have to be installed in order to make this work: GPS, pressure sensor, and an electronic compass. I am currently thinking about this option. Q: Is it easy to fly? A: That depends very much on the experience you have with radio controlled things. I think it is very easy to fly. In hover mode it works maybe like a coax helicopter. In acro mode, you have to know how to pilot a rc-helicopter. You should nevertheless have experience on how to control RC planes or helis (at least boats or cars...!). Q: What do I need to build a Shrediquette? A: You need a windows PC for my tools to run + the components listed on top of this page. Some experience in electronics (soldering) and controlling rc-planes would be a good start. 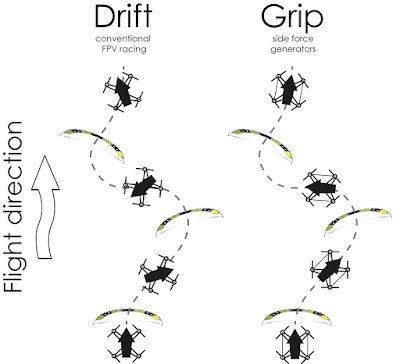 Q: When the tricopter stands on the ground, some motors are turning faster and faster? A: That is normal, please read the manual, section "Things to consider before take-off"
Q: In hover mode, the tricopter needs a lot of trim to stay in place! A: Please read the manual: You'll have to find the correct values for "X acc offset" and "Y acc offset". These values determine at what angle the tricopter thinks that it is perfectly levelled. You should also make sure that your IMUcube can't move on the tricopter. Otherwise you'll have to change the settings every time the cube is moved. When everything is set up correctly, the tricopter shouldn't need any corrections for trim. Q: I have problems using the GUI! Q: You didn't answer my email! A: Please notice that I get 15 to 30 emails each and every day with questions etc. on my copters. So I won't always be able to give you a very long and detailed answer, because I am also doing "some" other things in my life. Especially when I notice that you didn't even read the manual or the FAQs, my answers might become pretty short ;-D. If you experience problems, you should always give me an exact description of what you have done, what you want to do and what happened. I also need to know which components (servo, receiver, USB->serial adapter, Windows version, battery, ...) you are using and which of them are connected. Q: I like your frame and would like to buy one. Where can I get it? Q: The motors sometimes stop during flight! What can I do? A: Some ESCs seem to have problems with a high refresh rate. Also, I heard that it could be a timing problem in the ESCs. The easiest solution is to replace the ESCs. Q: My copter doesn't seem to be stable at all, what's happening? A: The most likely cause is either that your ESCs don't work (90% probability), or that your receiver is not working as expected (10% probability). Even if you use bad motors, have some vibrations, use bad propellers, have suboptimal parameters etc., the copter will always at least hover correctly. If it doesn't stabilize when hovering, something is going really wrong. The easiest solution is to replace the ESCs. Q: The 5V voltage regulator gets really hot! Why? A: This regulator is for the triguide, the IMU cube and for your receiver. The most likely cause is that your receiver draws a lot of current. If this is the case (try unplugging the receiver and check the temperature of the regulator), then you should use an additional 5V regulator for your receiver.